The bridges are over lakes & rivers. Heights range from 100-200 feet depending on water levels which vary by season and rainfall. You can drive to the bridges, no hiking is involved. Cost is $99 for 1 jump or $149 for 2 jumps (per person). 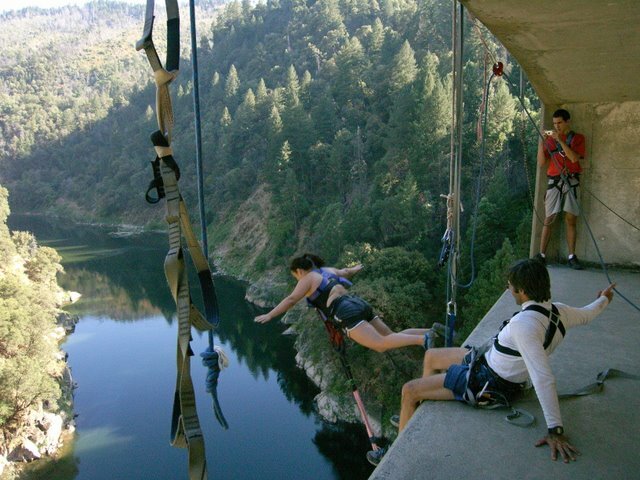 Normally jumps are done in a body harness which keeps the jumper upright & comfortably supported. Options include: ankle harness ($19), pictures & video ($19/each or $29 for both), GoPro ($29), water dips ($39).